Like most gamers out there, I play mostly with my family and friends. While the majority of my gaming occurs with my regular gaming group, I definitely enjoy introducing new games to my family. Visits to my parents’ house are always more entertaining when we can sit down and chat while playing a new board game. I’m sure most people can relate to that. While I have no shortage of games to play with my gaming group, choosing games to play with my non-gamer family members can be a bit more of a challenge. I always like to introduce them to new games (so we are not always playing Ticket to Ride or Carcassonne), but I have to be careful with my selection. Most non-gamers just aren’t going to sit through a 30 minute rules explanation of Terra Mystica. So with that in mind, we’ve created this article series. In Parental Guidance, I’ll offer up recommendations for games that you can play with your family members, whether they are retirees from the baby boomer generation or your own children. This article series will focus on games I’ve chosen and played with my parents (or sisters and niece/nephews). I’ll start by telling you what choices I made for our most recent gaming session (with a quick summary on the game), including why I thought my family members would like it. And to review how well my choices were, my mother (age withheld for decorum) will be offering her thoughts on each game we play. Hopefully this helps you find some new games to enjoy with your family members. Rocky Road à la Mode is a game of managing time and resources to meet the demands of customers. The game features multi-use cards and a time track that determines the players’ turn order. The player whose ice cream truck is furthest back on the road goes next, and may choose from several actions on their turn: drawing cards, taking an order, or fulfilling orders. Every choice costs time and forces players to move ahead on the road. Once a player is no longer in the rear of the pack; their turn ends until they find themselves lagging behind again. My wife is a big fan of Green Couch Games (she loves Best Treehouse Ever), so I figured I’d trot out the newest offering from them. All of their games have proven very accessible (and quite portable). We had played Rocky Road à la Mode once as a two player game, so she could help me explain the rules as well. I also figured that the Ice Cream truck theme might be a fun one for my parents to try. Pocket Madness is a rummy like card game where players are trying to rid their hands of cards. They do this by playing either sets or runs to the table. Playing sets will give the player access to special one-time-use cards, while runs will give their opponent’s madness cubes. The goal is to have the least amount of madness cubes once a player collects 10 of them. I chose Pocket Madness because I thought that the rummy-like nature of the game would make it easy to learn. Being able to draw parallels to existing mass-market games always makes a rules explanation go by much quicker. While my parent’s probably wouldn’t be too excited about a Cthulhu theme (crazy right? ); it’s fairly tacked on, so they can safely ignore it. Each player builds their own metropolis in Quadropolis, but they’re competing with one another for the shops, parks, public services and other structures to be placed in them. The game is played over 4 rounds, and there is a both “classic” mode and “expert” mode in this tile laying game. I know my mother has a fondness for tile laying games (she really likes Carcassonne), and I’m a bit of a city builder addict, so this seemed like a great choice. 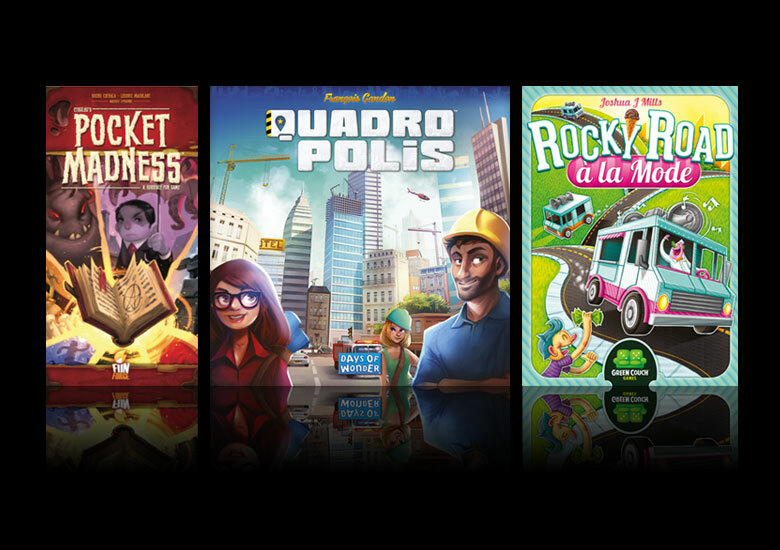 Plus Quadropolis is made by Days of Wonder, who are basically one of the Kings of making accessible euro games with great components. While the scoring can get a bit in-depth, the game comes with a handy player aid that helps players understand what each tile does, so I didn’t think that would be too much of a barrier for them. “I thought the instructions were easy to understand. I picked up on what I needed to do right away. I was a bit confused though about whether I was supposed to collect a blue or red resource, or pay one when I took a tile. The game pieces were nice, but I remember we kept forgetting to move the black pawn (not sure why it’s needed). Although by the end of the game, I knew what I needed to do, I hadn’t figured out a strategy for how to win or block my opponents. I was just trying to figure out where to put the tiles on my board 🙂 Not sure I would need to play this one again; it really didn’t do anything for me. There’s too much going on. There are other tile games that are easier and less “busy”.